The heroically entertaining "Thor: The Dark World" touches so many genre bases with such finesse that it will please not only comic book, science fiction and fantasy fanboys but also anyone looking for some light comedy and a little romance. And that means pretty much everybody. 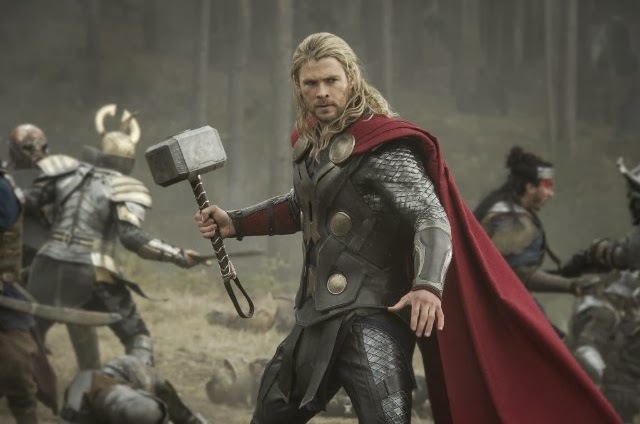 Chris Hemsworth returns as the Marvel Comics version of the big muscled, bass-voiced, bearded and blond Norse god of thunder, whose massive hammer is equally adept at smashing monsters and giving its owner the power of flight. The perfectly cast Hemsworth is likable and unironically sincere, but with just the right amount of beneath-the-surface melancholy to be interesting. Following the events of 2012's "The Avengers," the good-naturedly fearless and earnestly noble warrior has returned to his Asgard home. That magical realm, where laser-style weapons coexist with suits of armor and retro-futuristic Viking flying ships, is one of the universe's nine realms that also include Midgard (aka Earth). All of them are threatened by Dark Elves leader Malekith (Christopher Eccleston), who wants to unleash a universe-consuming energy force known as Aether. After Malekith and his forces invade Asgard, Thor realizes he must enlist the help of his deceptive half-brother Loki (Tom Hiddleston) to combat their overwhelmingly powerful enemy directly, instead of risking mass casualties in an all-out war. If that means treasonously defying Thor's big-daddy Allfather Odin (Anthony Hopkins), so be it. Hiddleston is a true highlight as the oily and wittily arrogant shape-shifter, who briefly and very amusingly assumes the form of one of Thor's fellow Avengers when he is released from his high-tech Asgardian prison cell. Will the ruthless villain of both the 2011 "Thor" and "The Avengers" be able to resist betraying the sibling he so viciously resents? Stay tuned! Idris Elba also is back as the all-seeing Asgardian sentry Heimdall, who brings a dignified gravitas to the proceedings but also gets some big action moments of his own this time around. Director Alan Taylor, whose credits include helming episodes of "The Sopranos," "Mad Men" and most significantly "Game of Thrones," gets both the superheroic and silly moments right. From alien battlefields full of literally flashing swords to "Star Wars"-style aerial pursuits to an earth-shaking showdown in contemporary London, the action is state-of-the-art impressive. Genuinely funny moments include Thor's mortal and very girly girlfriend Jane Foster (Natalie Portman) discovering that she gets cell phone service in an off-world cave, and nearly every scene featuring her adorably ditzy intern Darcy (Kat Dennings). The screenplay (by Christopher L. Yost, Christopher Markus and Stephen McFeely, from a story by Don Payne and Robert Rodat) is not only well plotted but full of great one-liners. When Thor damages a massive statue while piloting an alien vessel, Loki remarks, "Well done, you just decapitated your grandfather." After Odin tells Jane at their first meeting that he already knows who she is, Jane turns to Thor and coyly says, "You told your dad about me?" And there's something absurdly charming about seeing Thor in full costume aboard a London subway, asking a stunned rider if it goes where he's headed. The film's only drawback is that its "Dark World" title is a little too appropriate for the 3-D version. Removing those annoying glasses during the movie to see how much brighter and better things look without them should make audiences swear off 3-D forever. Even with that technical flaw, this is one of Marvel's most enjoyable outings. Like its Disney sister studio Pixar, Marvel has reached the point where everything it releases (even Pixar's "Cars" clunkers and Marvel's misguided "Iron Man 3") turn into box-office gold—but "Thor: The Dark World" is a genuine all-around winner. Also, be sure to stay until the end of the movie's closing credits, which include not one but two bonus scenes.